Every Tuesday, I participate in Doodle Tuesday, a group on Facebook. Most weeks, I submit a simple doodle from my daily journal, but recently, I have been participating in a Tangle Challenge within the group. 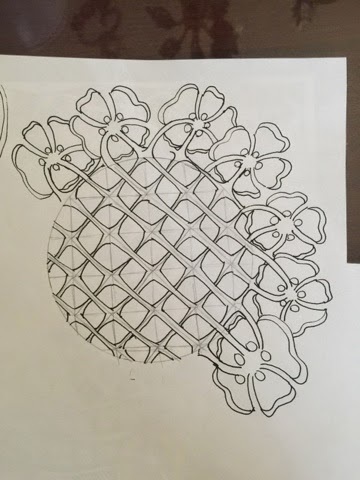 In the challenge, you have to use three zentangle patterns and one color to create your piece. If you have never heard of zentangle or have done one, you should check this out. I've been doing zentangle tiles and zentangle inspired art for about a year. There are hundreds of patterns and most require only a few simple strokes, anyone can do it, I promise! It really is a relaxing way to create art because the strokes are often repetitive and you get in a trance-like zone once you get started. Most of the patterns can be found here. This week, the challenge was to use B'twined, Blooming, Butter, and Hibred (don't you love these names?) and the color yellow. So here's my usual process. 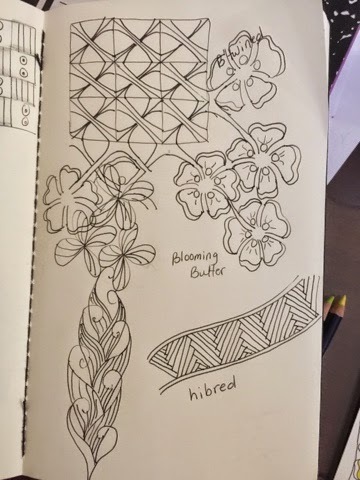 I practice the patterns in my zentangle journal. Once I'm comfortable with the patterns, I try to think of ways to combine them in one piece. Sometimes, I have a shape in mind and I fill the shape with patterns or other times, the patterns dictate the shape I create. I practice a bit then I start on my actual piece. For this piece I knew I wanted to combine B'twined and Blooming Butter so one would lead to the other. And then I decided to use Hibred to frame the others. 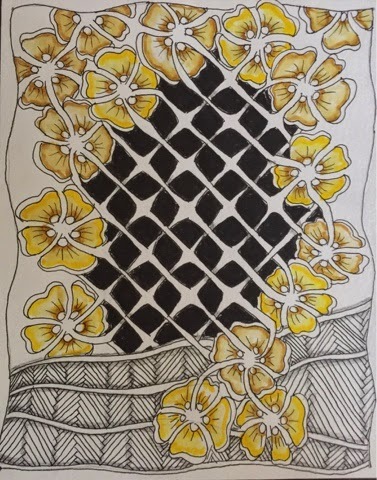 If you would like to see more of my zentangle inspired art, check out my YouTube video.